Larry Legend had some words for another, newly minted legend down in Texas last night. Those words were in praise of the career of Dallas Maverick Dirk Nowitzki, who confirmed his retirement after 21 seasons at what turned out to be his last home game ever. 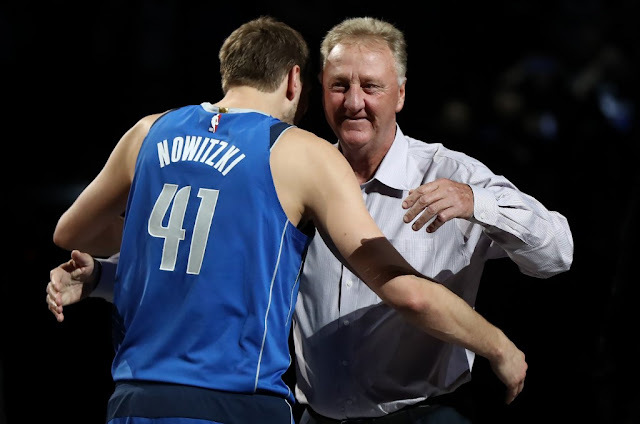 For his part, Dirk mustered one more performance for the ages, putting up a 30-point, eight board performance in their win over the Phoenix Suns, and after, Larry Bird had some jokes and a lot more praise for his fellow Hall of Fame big man. Watch the video above to catch Bird's full comments, and, from us at CelticsLife, respect to one of the league's longest-serving players - the game won't be the same without him. No, I'm not doing anything in support of Dwyane Wade's retirement, that's just silly.